This photo was taken July 2009 at the Old Town School Folk and Roots Festival. 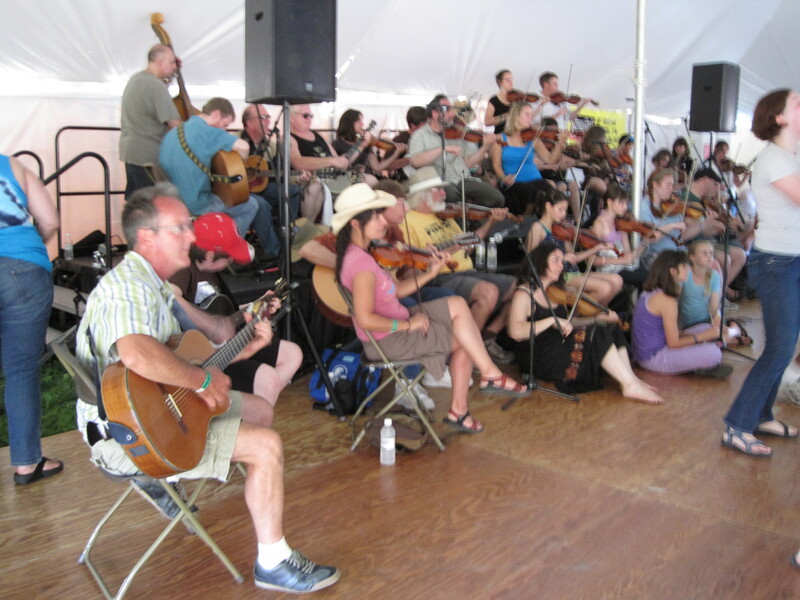 This was the first time I ever sat in on a square dance band. I had been playing for less than a year. It was a whirlwind of fun. The tunes were played fast. So fast! As you can see, there were many musicians, and any of my wrong notes went un-noticed. The band was so loud, I couldn’t even hear my own fiddle. After awhile, I gave up worrying about playing in tune or keeping up. I just leaned back in my chair, kept my bow moving and watched the dancers. Boy, was it fun. Tonight I am going to play my first square dance. Not with an open band. Just me, another fiddler, a banjo and guitar player. I am a little nervous, but mostly just incredibly excited. I’m still not proficient at playing at dance speed, but I will hang in there and hopefully my bow will figure a few things out along the way.